In my previous post, I discussed how I'd written a more-efficient NVidia-based scrypt coin miner and took advantage of the competitive advantage it conferred to (briefly) mine profitably on Amazon EC2 instances. In today's post, I'll break down the algorithmic and engineering details of that improved mining. You can read along in the code that I've released on github. Some terms: GPUs are big vector processors, but they can, at high expense, let the individual items in the vector "diverge" and take different paths through the code. As a result, NVidia refers to this as a "CMT" machine: Concurrent Multi-Threading. The "Kepler" architecture GPUs my code targets execute 32 threads at a time (in groups of 192 in total) on a single vector unit. where the something_expensive is independent of all of the other vec[i]'s. Such as, say, computing an expensive hash function on thousands or millions of input keys at the same time. Don't use too many variables (registers) per thread (vector entry). The GPU has a large but still limited number. Using more than 32 or 64 variables per thread can start to slow things down by restricting the number of threads that can execute concurrently. Don't use too much memory bandwidth. The GPU has a lot -- from 80 to 300 GB/sec -- but it's not infinite. Use your memory bandwidth well: If each thread reads a totally random location at a time, your code will be slow. If, instead, most threads read adjacent locations so that the overall read is a big sequential one to memory, you will get a lot of bandwidth. Keep the GPU busy while waiting on the host to do things. Let's see how we can tackle all of these. I'll start with the third first: Keep the GPU busy. CUDA provides a lot of mechanisms for, e.g., overlapping copies in & out of the GPU and running the parallel code (called a "kernel"). This is a good idea, and it's what Cudaminer did. I decided not to, and instead, I moved all of the mining functionality into the GPU so that I can invoke it, have it run for a long time, and then very quickly invoke it again with the next (small) job description. 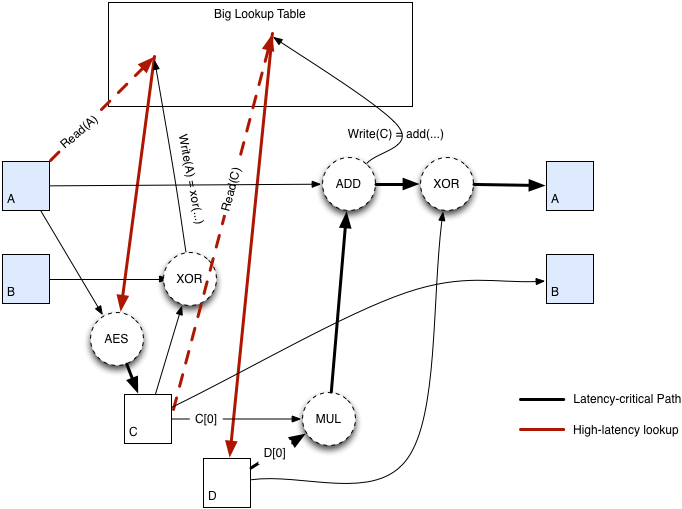 This required implementing more stuff on the GPU, but simplified the architecture. 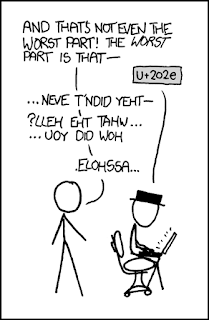 // hashed_key is 1024 bits of state data. State[i] = hashed_key // State is 128KB. In these terms, the prior work, Cudaminer, ran the PBKDF2 code on the host CPU, and ran only the scrypt core loops on the GPU. As a result, it had to copy in 1024 bits (128 KB) per key in and out of the GPU. My code moves the entire search process in to the GPU, returning only a single integer of whether or not a scan for several thousand nonces succeeded or not. You can see the ScanNCoins function in hasher.cu. By doing this, each invocation of the kernel requires copying in and out only a few hundred bytes of memory, and the kernel runs for decent fractions of a second, ensuring very high utilization. I implemented PBKDF2 by simply copy/pasting the simple CPU versions from Colin Percival's code. The implementation of PBKDF2 on the GPU is trivial and could no doubt be optimized, but it's only 3-4% of the total runtime, so it didn't seem worth it. Spread one key's work across multiple cores. The advantage to option #1 is that it's simple. The existing CudaMiner code, for example, follows this pattern. You can almost literally take simple CPU-written code and copy it into CUDA and it will work. This is exactly how I did PBKDF2. It's not amazing, but it's fast enough. The drawback to option #1 is that if the work involves a lot of state or memory, you can't run a lot of parallel threads: You use up all of the registers and SRAM on the GPU with relatively few threads. From looking at scrypt above, it should be clear that there's a lot of state for each key being evaluated: About 1024 bits of current key state, plus it reads another 1024 bits. Stored in 32 bit registers, this is over 64 registers per thread - more than the GPU can handle, and thus, it will start spilling registers to L1 shared memory and slowing down. Of course, taking option #2 requires going quite a bit deeper into the algorithm and extracting more parallelism from it. (This is fun.) Fortunately, there is about a 4x increase in parallelism to be found in scrypt. Interestingly, on most GPUs, scrypt is not memory latency or bandwidth limited: It's compute bound on both CPUs (using L2 cache) and GPUs (using high-bandwidth memory). So if we can parallelize the instruction stream inside it, it may be worthwhile. So, this looks cool. The input to the hash function can be done in parallel up to 16 ways (xors and addition). The mixing in the middle can be done by four threads in parallel: each row (and column) can be mixed independently. However, there's a transpose in between: The thread handling column 1 must go from operating on x0, x4, x8, x12 to operating on x0, x1,x2, x3. Enter the NVidia Kepler architecture shuffle instruction. Shuffle lets threads steal registers directly from other threads in a "warp" (or group of 32 threads that are executed concurrently). Using this, we can execute the inner-loop transpose in only three instructions. You can see this in hasher.cu in the salsa_xor_core function. Thread t recruits thread t+4 to write four of its 32 bit registers for it. This is in the read and write_keys functions in hasher.cu. And, by moving all of the PBKDF2 functions into the GPU and reducing the number of host-side kernel invocations, the CPU use drops from 20% down to 0%, freeing up a bit of host CPU for mining if you're so inclined. The status of the code is so-so: I haven't integrated it with a miner in a nice, usable way yet, so building it is a hack. There's also a known issue (bug?) that my code works on my Macbook's GT550m, a Tesla K20c, and on Amaon's Grid G2, but it slows down after 15 minutes of processing on a GTX 650Ti for no reason and only a machine reboot fixes it. I'm not sure if that's a code problem or a GPU problem.